You're playing a friendly game of beer pong with your buds, and of course, you chase down the little ping pong ball 85 times, dunk it in that sketchy water cup and deem it clean. It's a familiar setting and everyone has accepted that they're drinking beer filled with dirt, cigarette ash and probably even dog poop residue, but there's finally a real solution for your dirty balls. Some geniuses on the east coast invented something that should have been around since the inception of beer pong — protective cups that completely cover your beer. With the "Slip Cup," that dirty ball never touches your cheap beer and still keeps the integrity of the game in tact. 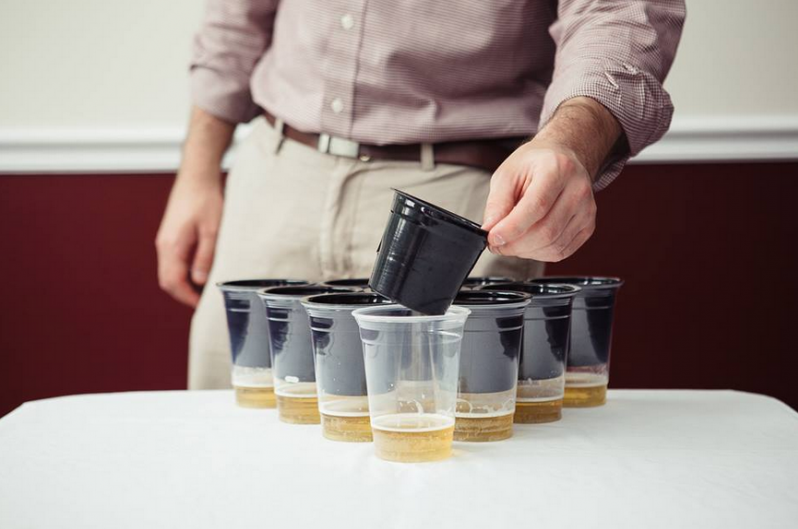 The Slip Cups are designed so that you can pour the beer in your cup per usual, but still has the depth to keep your ball from bouncing in-and-out. As of this writing, their Kickstarter campaign has raised $32,895 with a $70,000 goal to get the project up and running. With 22 days left to reach the goal, it's likely that it will be fully funded, and you'll never have to worry about cleaning your balls again. UPDATE, July 9, 2015: Their Kickstarter campaign has officially been fully funded. They have surpassed their $70,000 goal and have over $76,000 raised with almost 3,000 people backing it. They'll start shipping out the Slip Cup in September.